Hanging in my foyer is R.S. 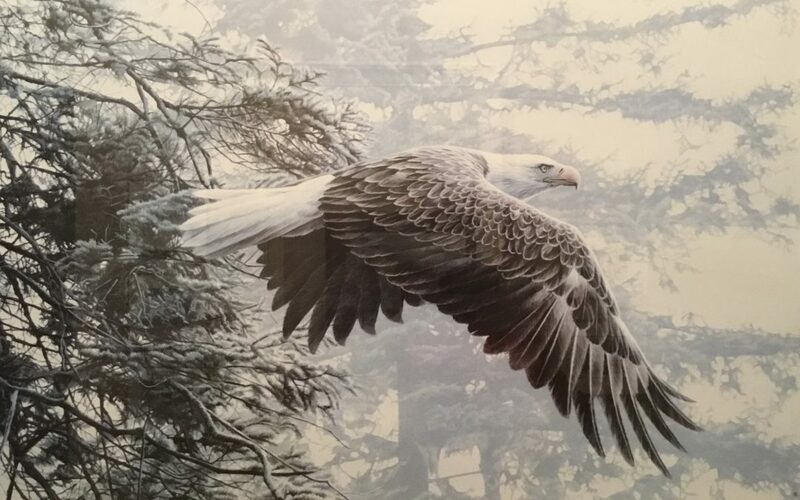 Parker’s 1991 painting “Through the Firs Eagle” (pictured here.) It’s probably the first thing you”ll notice when you walk into my house. 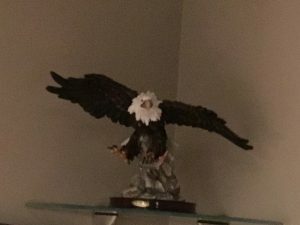 Why do I collect eagles? Although the eagle is a national American symbol, that isn’t why I collect eagles. I’m not American. I’m a Canadian. And we don’t have a national affinity for the American Eagle. It’s just another raptor to us. 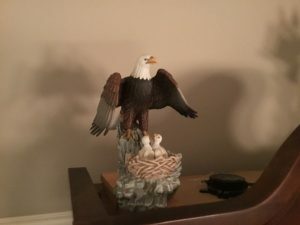 So people are sometimes surprised that I, as a Canadian, collect Eagles. 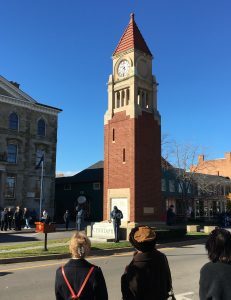 But what does this have to do with Remembrance/Veteran’s Day? This is all connected to my Dad. 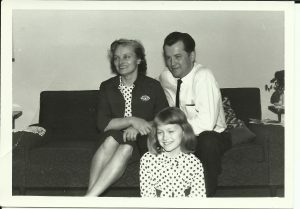 On November 11, 2011, my Dad slipped into eternity. Although his younger life was marked with personal struggles, he knew the Lord and taught his children the Christian faith as best as he understood it. Later in life, he fell in love with Jesus and committed the rest of his life serving his Lord and Savior and his community. He volunteered tirelessly in his church where he ministered as elder, advisor, teacher, minister, board member, janitor—virtually every and any position. Whether cleaning toilets, counseling the youth, visiting the sick, or preaching the sermon—he was well respected in both the church and his local community. His spiritual influence was evident at his funeral, where multiple personal testimonies were given. I remember being overwhelmed at the sheer number of mourners at the service. Since I lived almost two thousand miles away, I never fully appreciated the impact of his life until then. You see, I knew his flaws. I knew the man who raised me. But I left home in 1972. A lot happened between then and 2011. So I didn’t really know the man who died that day—at least not as well as I thought I did. Around the age of eleven Dad gave me a book about eagles. That book contained scientific info about eagles complemented by a dozen verses from the Bible regarding these magnificent raptors. Many times I reread this cherished book. It’s probably still tucked away somewhere in a dusty box of collectibles. My introduction to eagles became a lifelong fascination. Among other things, I learned that eagles fly into the storm, not away from it. The stronger the wind, the higher they fly. This taught me the challenges of life can make us stronger if we face conflicts head-on instead of running from them. I also discovered that adult eagles love to bring shiny trinkets to the nest for their babies play. This reminds me of my heavenly’s Father’s love for me—how he cares about my happiness. I believe the unexpected surprises in life are often God’s way of reminding me of his love. If you google “eagle facts”, you’ll discover fascinating trivia very applicable to life and spiritual growth. The man who taught me about eagles always reminded me to look upward and remember where my strength comes from. It seems fitting that he died on 11/11—the perfect day to remember a spiritual war hero. Since my Dad’s death, my husband and I make a habit of attending one of these memorial services. It just seems appropriate. After the service, we enjoy a quiet lunch. At home, I’ll turn on the fireplace and watch replays of the National services or put on a reflective war movie. This is when I sit back and look around my house at all the eagles displayed and I remember Dad. 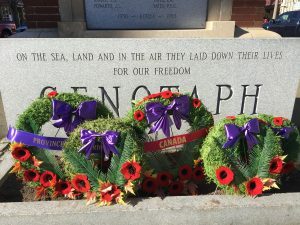 The poppies worn on November 11 salute the war veterans who died. But it means much more to me. 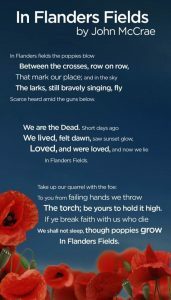 The poppy I wear reminds me of one of my spiritual heros—my Dad. And it reminds me of the day he died. 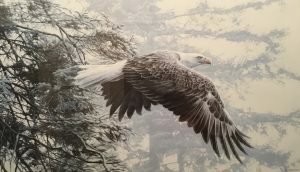 The eagle sculptures and paintings bring to mind the Biblical teachings I received from him and they prompt me to revisit Isaiah 40:31. And this encourages me to wait on the Lord and rely on Him for my daily strength. 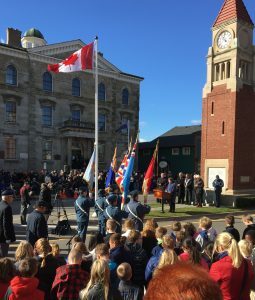 Remembrance Day, Poppies, Dad, Eagles and Isaiah 40:31. Intimately connected. 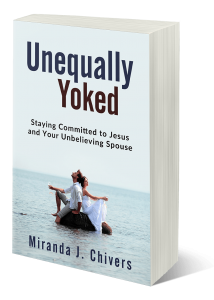 Looking for support in your unequally yoked marriage? Shoot me a message through my facebook page or this website.